This summer is the FIRST summer that I have ever been able to have a full size garden in my backyard and I AM LOVING IT!!! In the past, we haven't had a yard to put a garden in so I have always grown my produce in pots. This year, I am able to grow A LOT more and I am have loved every minute and every bite so far! Along with a lot of produce, I am also excited to try canning some of it this year (if there is ever any extras...my kids eat like 3 teenage boys!). When I want canning answers and help, I turn to the only brand I know and trust when it comes to canning my organic produce: Ball Brand! They actually just celebrated the fifth annual Can-It-Forward Day this last Saturday August 1st where they broadcast live online at FreshPreserving.com from their new state-of-the-art Jarden Home Brands headquarters in Fishers, Indiana. An event celebrating the joys of fresh preserving, Can-It-Forward Day encourages gardeners & food enthusiasts across the country to celebrate what “Made From Here” means to them by fresh preserving their favorite local ingredients in peak season. The webcast has an integrated chat function where viewers can submit their home canning questions to be answered in real time. New this year, there will also be an exciting celebrity mason jar auction unveiled during the webcast! The Can-It-Forward Day video will be available to tune-in and watch at any time! Meanwhile, you can start thinking about canning all that tasty produce you have in your garden as Fall arrives soon. This really is the perfect, easy home canning starter set. It comes equipped with a canning rack, recipe guide and jars, all you need is a recipe and stockpot to begin preserving! With this great starter set, I don't have to scramble at the store trying to figure out what I need to buy for canning. I love that it gives me everything I need in one box and all I need is my produce and pot to get started! 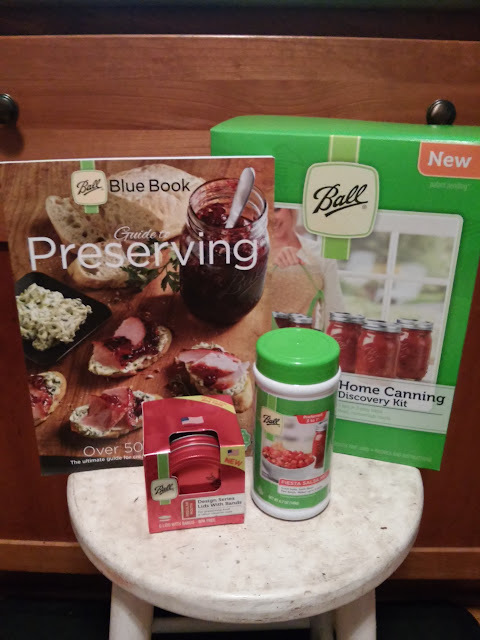 The new 37th edition of the Ball Blue Book Guide to Preserving is the most trusted resource in home canning for over 100 years and this new 2015 release is its largest update since the first edition in 1909. Expanding 56% from the previous edition, the 37th edition of the Ball Blue Book includes 75 new recipes, pictorial step by step guides for beginners and more! I love all the great pictures (I am a visual learner!) and the recipes give me so many great ideas for canning this Fall! I just can't wait!!! Great not only for home canning, the Ball® Brand Design Series Lids With Bands are also a great option for unique crafting creations, gifts and home décor with endless mixing and matching possibilities. I love how fun these lids are and I can't wait to see this color filling my cupboards once I finish canning this Fall! Better tasting, fresh salsa is simple to make with Ball Brand Fiesta Salsa Mix. Simply add fresh, vine-ripened or canned tomatoes, and mix with a splash of vinegar for perfect salsa every time. There isn't much I love better than fresh salsa! I am so excited to try this out with my fresh picked tomatoes from the garden! So as Fall approaches, don't be sad Summer is over. Get excited to start canning with Ball products and your fresh veggies and fruits!! I know I can't wait! They have made it so easy for me to get started canning and I don't feel nervous about it anymore! You can purchase all Ball products from the Fresh Preserving online store. Ball is generously offering (1) free case of jars (in form of free product coupon) to a lucky winner!